For the production company, see Propaganda Films. For the 1999 Turkish comedy film, see Propaganda (film). The Why We Fight Series depicts the Nazi propaganda machine. Propaganda is the ability "to produce and spread fertile messages that, once sown, will germinate in large human cultures.” However, in the 20th century, a “new” propaganda emerged, which revolved around political organizations and their need to communicate messages that would “sway relevant groups of people in order to accommodate their agendas”. First developed by the Lumiere brothers in 1896, film provided a unique means of accessing large audiences at once. 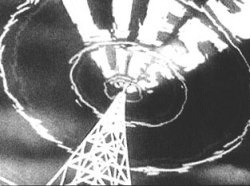 Film was the first universal mass medium in that it could simultaneously influence viewers as individuals and members of a crowd, which led to it quickly becoming a tool for governments and non-state organizations to project a desired ideological message. As Nancy Snow stated in her book, Information War: American Propaganda, Free Speech and Opinion Control Since 9-11, propaganda "begins where critical thinking ends." Film is a unique medium in that it reproduces images, movement, and sound in a lifelike manner as it fuses meaning with evolvement as time passes in the story depicted. Unlike many other art forms, film produces a sense of immediacy. Film's ability to create the illusion of life and reality, opening up new, unknown perspectives on the world, is why films, especially those of unknown cultures or places, are taken to be accurate depictions of life. Some film academics have noted film's great illusory abilities. Dziga Vertov claimed in his 1924 manifesto, “The Birth of Kino-Eye” that “the cinema-eye is cinema-truth.” To paraphrase Hilmar Hoffmann, this means that in film, only what the camera ‘sees’ exists, and the viewer, lacking alternative perspectives, conventionally takes the image for reality. Films are effective propaganda tools because they establish visual icons of historical reality and consciousness, define public attitudes of the time they're depicting or that at which they were filmed, mobilize people for a common cause, or bring attention to an unknown cause. Political and historical films represent, influence, and create historical consciousness and are able to distort events making it a persuasive and possibly untrustworthy medium. ^ Bennett, Todd. "The celluloid war: state and studio in Anglo-American propaganda film-making, 1939-1941." The International History Review 24.1 (March 2002): 64(34). ^ Snow, Nancy (2003). Information War: American Propaganda, Free Speech and Opinion Control Since 9-11. New York: Seven Stories Press. p. 22. ISBN 978-1-58322-557-8. ^ Benjamin, Walter. "The Work of Art in the Age of Mechanical Reproduction". Retrieved 7 November 2011. ^ Resina, Joan. "Historical discourse and the propaganda film: Reporting in Barcelona". Retrieved 7 November 2011. ^ Stern, Frank. "Screening Politics: Cinema and Intervention". Georgetown Journal of International Affairs. Retrieved 5 November 2011.